Here we are going to attempt to show some of the History of the area we are in and have been in Texas for the past few years. 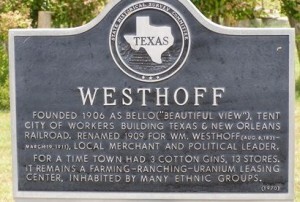 Presently we are near Westhoff Texas. There sure a lot of oil drilling sites in the area of Westhoff. Where are you located in relation to “Westhoff Cemetery”?